This 3-5/8" big bore kit may be used to replace the cylinders and pistons of an engine that has been upgraded with an S&S 96" Hot Set Up Kit® with stock cylinder heads. This kit may also be used to upgrade an engine with an S&S 89" stock bore stroker kit to 96". Stock crankcases must be bored to accomodate the 3-5/8" bore cylinders, but the 4-5/8" stroker flywheel assembly does not need to be rebalanced. 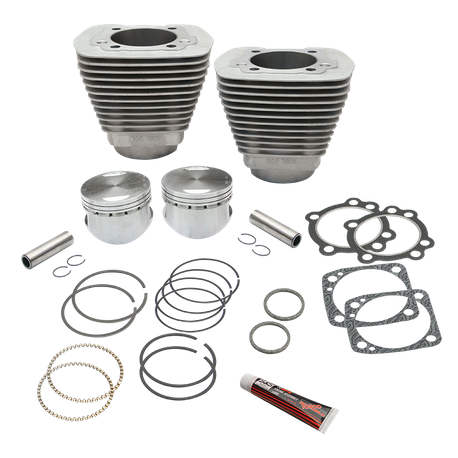 The kit includes S&S 3-5/8" bore cylinders, 3-5/8" bore forged flat topped pistons with rings and wristpins, head gaskets, base gaskets, exhcaust gaskets, and instructions. Compression is 9.75:1. The cylinders are nearly stock length, so stock length pushrods, and manifold may be used.